SUCCESS SECRETS: Nigeria beat Cameroon four goals to nil! It was a big surprise, but the super eagles of Nigeria today trashed the indomitable lions of Cameroon four goals to nothing (4-0). The match was played at the Godswill Akpabio stadium in Akwa Ibom. Considering the fact that the super eagles already top the group and have a good goal difference, one expected to see the Cameroonians firing on all cylinders to keep their hopes of qualifying for the world cup, Russia 2018 alive. Fabrice Ondoa's experience and goal keeping dexterity also makes such score line imaginary at best. But alas, that is the reality. When you remember the humiliating defeat suffered by the super eagles of Nigeria on Saturday 10th June 2017 at the same venue, where they were defeated by the South African National team two goals to nothing in a nations cup qualifier, you will understand why today's match results appear to be a total anomaly. This four goals to nothing defeat parallels the defeat suffered by the gunners, Arsenal FC of England , in the premier league. Arsenal FC was defeated by Liverpool four goals to nothing at Anfield on Sunday 27th August, 2017. Cameroon is now the official national team of Arsenal. 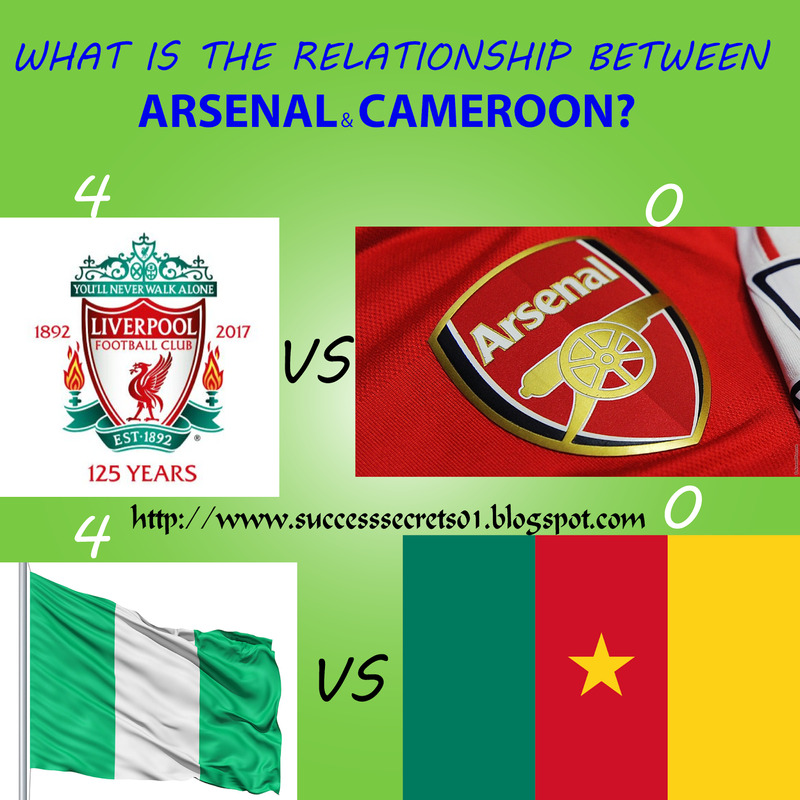 When you look at the match between Nigeria and Cameroon as well as the match between Liverpool and Arsenal, it is so easy to see why Cameroon and Arsenal can easily reach such an agreement. Just as Arsenal and Liverpool are top teams in the English premier league, Cameroon and Nigeria are top teams in African football. The game between Liverpool & Arsenal was week three of the 2017/2018 premier league season. The game between Nigeria and Cameroon was the third in CAF group B of the FIFA 2018 world cup qualifiers, Russia 2018. Arsenal played the game against Liverpool at away and had the experienced Peter Cech in goal. Similarly, Cameroon played the match against Nigeria at away and had the experienced albeit young Fabrice Ondoa in Goal. Arsenal conceded two goals in each half and Cameroon also conceded two goals in each half. There are many more similarities between the two matches, but we will not write them here. We will wait to hear them from you, as you drop them in the comment box. WHAT IS THE RELATIONSHIP BETWEEN ARSENAL FC AND CAMEROON NT(national team)??? Could it be true that Cameroon is now the national team of Arsenal FC?